As someone who knows all too well how much a blowout can cost, I felt like I had just found LA's best kept secret when I stumbled upon drybar, Brentwood's new blow dry salon. Yeah yeah, not exactly WeHo, but it's too good not to mention! Many women know how important a coiffed mane is for interviews, meetings and parties, which is why you see a majority of them flocking to their nearest salon in search for the best blow out they can find. Unfortunately, they'll end up paying at least $65 for their style -- and usually that doesn't include a wash or take into consideration the length of hair. 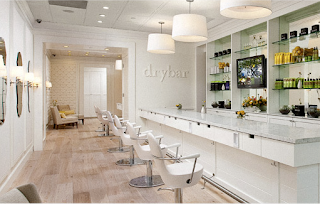 Drybar offers an affordable solution that doesn't compromise a fabulous experience. On Brentwood's San Vicente Boulevard, whisk yourself away to a white relaxation station that looks more like getaway than a regular hair salon; a little bit modern, a little bit country, but completely fabulous. With five different blowouts (Straight Up, Mai Tai, Southern Comfort, Manhattan, Cosmopolitan), late hours (open until 8:00 p.m. Thursday - Saturday), and online booking, what's NOT to love? Furthermore, they have a "Spirit Director" that's in charge of making sure everyone enjoys adult refreshments and "feels like it's their birthday" when they visit. The blow dry comes with a wash -- add on a "floater" (10 minute scalp massage) to indulge yourself even more. The best thing is the shampoo bowl chairs don't look like scary dentist chair contraptions; it looks like something you'd have in the comfort of your own home. Don't have time to visit the salon? Order a "Dry on the Fly" for only $75 and they'll come to you! 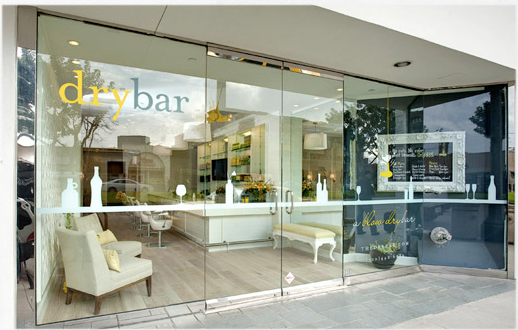 Drybar. No cuts. No color. Just blow drys. Only $35.